Much of my day job at the moment is spent in the offices of organisations other than the RSPB and in particular the County Hall of West Sussex County Council. As I arrive, I pass by the manicured lawns and rose beds that front the building, and head into whatever meeting I'm attending that day. But the bit I love the most is a rather tucked away corner, outside and around the back. 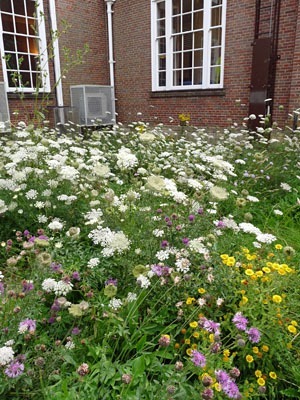 What the Council has done is abandon the very formal, and instead they've sown wildflower seeds. It's a little haven of Wild Carrot, Fleabane, knapweeds and other species. I think it is fantastic. There are bees and hoverflies and who knows what else in amongst the shelter and microclimates of all those stems and leaves. It is one giant wildlife salad. I think it also brightens up this rather dull corner. It cuts down the carbon footprint of all the mower work needed elsewhere. And it even is probably even kind of the purses of the folk of West Sussex because it doesn't need daily tending. So a big thumbs up from me - it's definitely a big step in the right direction. And I look forward to the day when the Council - and society - feel that this wouldn't be out of place on the front lawn either! I agree too this should be in the front of the building too. Such a shame it has to be hidden away. There's a patch I walk through to and from work, just as I think it's starting to look lovely the council come along and cut the grass. I love seeing wildflowers grow. So sad when I go past after they've cut it. I miss the daisies, dandelions, clover - they're the one's I can recognise! Loving the idea of "Wild Britain in Bloom" - another supporter found. Yes, I've found that Phacelia tanacetifolia is fab too, and the Americans swear by it. Some of the wild flower plots on farmland here on the South Downs use it in the mix, which is great. And it's totally slug/snail proof too. It's so easy to grow from seed too. Our council is getting a lot better with leaving areas for wild flowers, the verges have been a picture this year. They could have stumbled across the fact that it is a lot cheaper to let nature have her way. There are no expensive weed killers and the cost of mowing is drastically reduced if it doesn’t happen as often. We recently drove from Devon to Yorkshire, what a difference we noticed along the way. Some councils are doing beautifully and their verges are a true delight, full of wild flowers and colour, while others are still hanging onto sterile, neat, short grass. I discovered a new Bee plant this year, Phacelia tanacetifolia, it’s a green manure with the added bonus of having very pretty flowers which are real bee magnets. I so agree with you! Our town council is still so pedantic about everything neat and tidy, flowers standing to attention in rows! It's probably down to the personalities involved, if the councillors want everything neat and tidy in their lives, they expect the same to apply everywhere. 'Britain in Bloom' doesn't really help - they expect the same. Will someone start a 'Wild Britain in Bloom' with prizes for the most flora and fauna species seen on judging day?! !